Jolie Byrne is the best selling author of “The Problem with Pixies.” She has published two sequels to it, “The Trouble with Trolls” and “The Drunken Dragon.” She is also a really big nerd. She plays tabletop roleplaying games in her spare time and when she’s not doing that, she hunkers down in front of her PS4. She is also a very avid reader of pretty much anything she can get her hands on. 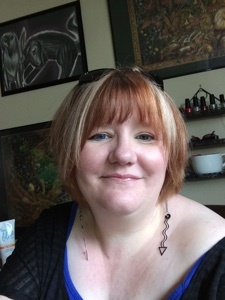 Ms. Byrne calls the city of Spokane, WA home and lives there with her incredibly supportive husband and her three Labradors: Jet, Lexi and Zoe. She wouldn’t get much writing done without her “furkids”, though sometimes their antics are so legendary that it’s difficult for her to get any real work done. It’s not easy being a dragon. Elvis Jones has it rough. 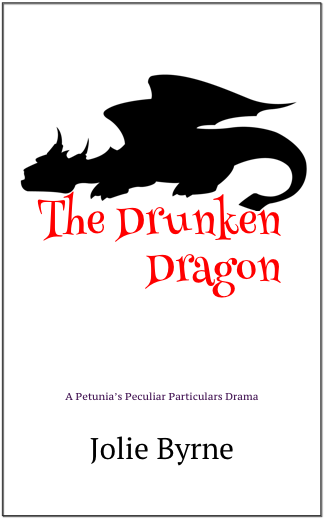 Alcohol has taken everything from him, his job, his apartment and even his ability to control his shapeshifting. With no hoard to sustain him, Elvis is relegated to sleeping in homeless shelters and making deals with trolls just to get by. When he encounters the mysterious Petunia Petaluma, Elvis is offered a chance at salvation, but salvation has a price. In order to succeed, Elvis has to stay sober for one whole week and keep track of a single gold coin. It seems easy enough, but this dragon drinks to forget and when confronted with his demons, Elvis has to make a choice that will change the course of his life forever.